The second novel by the author of the award-winning Mrs. Kimble depicts life in a postwar Pennsylvania mining town and continues Haigh's exploration of the hardships of women's lives. In the town of Bakerton, dominated by the towers of the title (made of slowly combusting piles of scrap coal), poor families live in ethnic enclaves of company houses. Italian Rose Novak broke with tradition by marrying a Polish man, but he dies in the book's first chapter, and Rose and her five children struggle through the years that follow. Copyright © Reed Business Information, a division of Reed Elsevier Inc. All rights reserved. The story starts with the beginnings of a Pennsylvania mining town and ends when the town starts a new beginning. The reader follows the Novak family during that period of time. Rose and her children George, Dorothy, Joyce, Sandy, and Lucy discover life inside and outside of Bakerton. Although most of the children can't wait to escape the mining town, the find themselves drawn back time and time again. Starting with their father's death, the family find themselves facing a life where the only certainty is the small company house that they all called home at some point. This book was a bit difficult for me to get into but when I did, I really enjoyed it. The story follows all the family members of the Novak family but jumps from person to person with no real introduction and skips long periods of time. Sometimes I would read full paragraphs without knowing from which point of view I was reading and where their particular story was set. This was frustrating but I soon became accustomed to this style. As I got to know the characters better, it became easier to ascertain. The reading and the story became smooth sailing after that. I enjoyed the trip through time, following one family as it expanded over the years. This book is character driven and I enjoyed following as each character's personality, quirks, and story unfolded. They were extremely well-written. I often wondered how the story would end since there wasn't much of a plot. It seemed that the book moved just by the passage of time, but when I got to the end, it made it a bit more sense to me. I thought the wrap-up and ending was quite perfect and satisfying. Ahhh if it all sound so vague, perhaps it is because this book is about the ups and downs of life and saying more would spoil it for many. This reminds me of a Maeve Binchy novel in it's organization and style. Though the community aspect is present, it doesn't have the same homey feel. Once I got to know the characters, I was very invested in this book and couldn't put it down. Books that are mostly character driven and those that are plot driven can be such different reads! Which do you find you prefer more? I read this book last spring and liked it. I would recommend her newest book, Faith. It has more of a plot and it was just so good that I couldn't put it down! I had the opportunity to read Faith and chose this one. 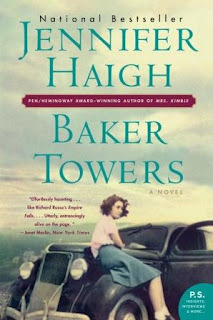 I'll definitely read this Ms. Haigh again. It actually sounds pretty interesting! I think I would like it too if I got into it fast enough - I'm not a very patient reader. I like the cover too, which is a bonus. It takes an adjustment but it is pretty quick, I think. I don't remember. I just remember thinking it was going to be a dud and then I got used to it and it was wonderful. Hmmm...It couldn't have been too long. I just won a copy of this book and am excited to read it. Good to know that it might take me a bit to get involved in the story. Just a little bit but I think it will be worth the read. I think I'm more of a plot driven person. Trying to read a book and I'm not sure whose speaking would drive me nuts. I'm glad you were able to get past that and enjoy the book anyway. I think I'm more character driven because it often requires better writing. I don't think the writing has to be great in plot driven books but then maybe that is a plus for plot driven books. I kinda like both. It depends on the book really. I probably would say plot driven books are more my thing. I have FAITH by Haigh. I'm looking forward to reading. I like the setting and era that Baker Towers is set in. Great honest review! I'm hearing that I should read FAITH, I'm thinking I need to add it to my list. A satisfying ending can make a book for me (or break it, if it isn't all that satisfying), so I'm happy to see that this one was good. I loved the ending. It really made everything come full circle in a way that I could understand and appreciate. Plot driven books are definitely more exciting. To answer your question, I'm always gonna love a character focus more; even in super-action-ized books it's the character building I'm gonna really love. I blame it on the fact my reading needs were educated with classics (books published like 100+ years ago - wow, right? ), and those guys were always pretty big on character. They were pretty big on everything, in fact, it sometimes got tiring I guess, heavy, lol. I'm liking contemporary directions more, good often comes in a light, comfy package. Oh I agree with you totally! I think I enjoy character focused books more as well. They stick with me because I feel like I made a new friend or too.